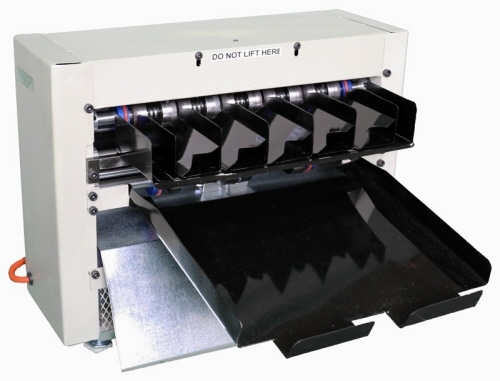 The Erso 1005FB is a full bleed automatic electric business card slitter with gutter cuts between blades. It accepts 10 up 8.5" x 11" sheets of printed business card stock. 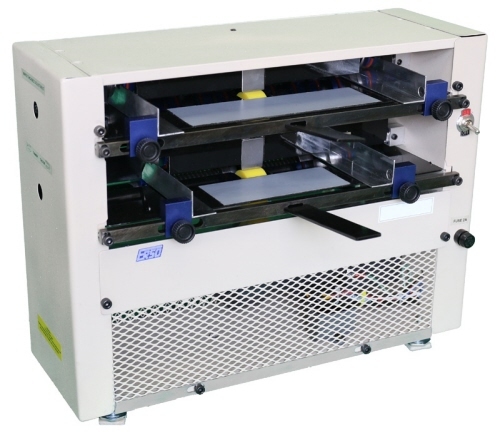 Call for pricing - this card slitter and cutter can be customized to suit your specific template needs. This model allows you to produce 10 full color 2" x 3.5" business cards from an 8.5" x 11" sheet with a simple two-pass operation. Paper Sizes Accepted 8 1/2" x 11"
First pass cuts an 8.5" x 11" sheet into two 3.5" x 11" strips with a 0.125" (1/8") gutter in between the strips and then second pass cross cuts these two strips down to finished 2" x 3.5" cards with a 0.125" (1/8") gutter in between the cards. 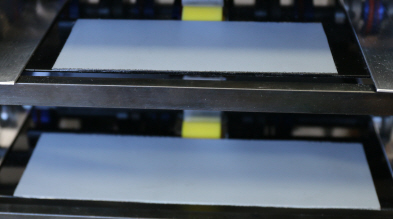 The feed stack allows keeping up to 50 pages of 14 pt /310 g/m2/ paper and cutting at a speed of up to 400 business cards per minute. 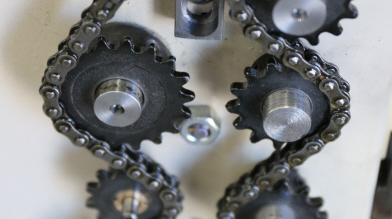 Solid metal gear / chain drive system - NOT belt driven. 115 VAC, 50 - 60 HZ, 2.5 A, 220 - 240 VAC available. 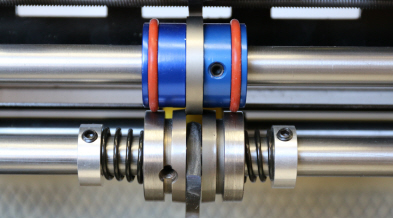 Chain driven, with solid metal gears and runners ensures reliable and ongoing performance even in the busiest of print shops. 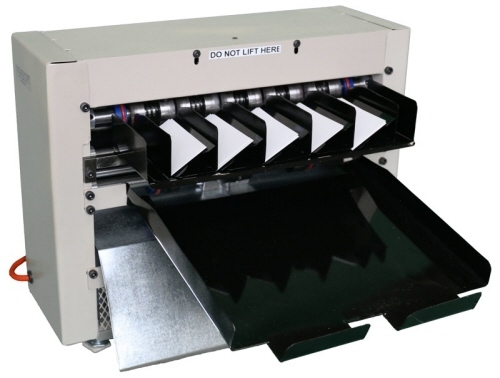 Adjustable feed tray with Free slip tray runners allows printed matter to pass cleaning and evenly through feed into cutting system while keeping stack and final feed sheets from bowing. Solid milled shafts and long lasting cutting blades ensures performance business card slitting and cutting and accepts a variety of thicknesses and printed materials. As with all models, the Erso Full Bleed 1005FB comes with convenient clean stack exit catch trays with side waste removal recovery for quick processing and packaging of final cut business cards and clean-up.